Share the post "Happy Paper Club"
Hello, it’s a papery day here today! 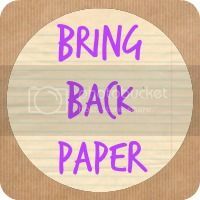 I hope everyone’s enjoying this month’s #BringBackPaper challenges and there’s still time to get involved in this month’s stationery swap, too. I have swapped and loved it! I’m not reading as much this month, though I have of course read a couple of books, written a fair bit of snail mail, so I now need to concentrate on create! I’ll think of something….! Next Wednesday will be the monthly Papery Peep linky here, so do get ready to come and share your paper with us. Today I’m bringing you a guest post from the lovely Gabrielle, where she’s sharing with us all about her new Happy Paper Club…. Thanks so much, Jocelyn, for having me to visit on your blog, it’s lovely to be here! Hi everyone, my name is Gabrielle and I run a business called the green gables. I design and create papery goodness to help you get organised, connect with others in a heartfelt way and spread a little joy too. Jocelyn has very kindly invited me along to tell you about something that I think you lovely paper-loving, mail-sending, cheery-living bunch are going to like very much – Happy Paper Club! It’s the new monthly stationery and joy-filled subscription service from the green gables. I previously ran a stationery subscription service in 2012-13 called the Eco Stationery Club (anyone remember back that far?). I’ve taken everything I learned from that experience and created Happy Paper Club. This is no ordinary subscription service, the clue’s in the title – I’m sending you happiness as well as papery goodness. As you’re well aware, everyone loves to get real post popping through their letterbox, especially when it’s not a bill or junk mail. The contents of each Happy Paper Club box – a mixture of the green gables’ stationery, inspirational messages and items exclusive to the Club – are designed to make your life that little bit easier and raise your happiness level. Items to help you get organised and find more time to do and appreciate the fun stuff in life. Pieces that you can keep for yourself or send to others to give them Happy Post Days. And inspirational quotes to lift you up and raise a smile. All popping through your letterbox each month from just £10 a month including UK delivery (boxes ship worldwide too). Plus, subscription members of Happy Paper Club also benefit from a discount on everything at thegreengables.co.uk, and can look forward to a little surprise treat in their birthday month! And because surprises make the best Happy Post, the exact contents of the box will be kept secret until it lands on your doormat. You can find out all the details of Happy Paper Club here before subscriptions open on Sunday 1 March 2015. There’s a limited number of boxes and once they’re sold out subscriptions will close until the next box is made available on the 1st of the next month. To make sure you know the moment subscriptions are open, you can subscribe to the newsletter at the web address above. Thanks again for having me, Jocelyn, and I hope to see you all in Happy Paper Club soon! Thanks, Gabrielle! What do you guys make of Happy Paper Club then? This looks great – I particularly like that there’s a try it and see option, which could also be used as a dip in every now and then. I’m not sure I would want to commit to something every month as I’d quickly find myself overrun with stationery as my problem is I struggle to part with it at all! Oh, now then! This looks so good! What a sweet little ‘twist’ that there’s a limited number available too! Yep, a nice little exclusivity in there, too!